Successfully Added Angel of Death Color Light - 3D Effect, 7 Colors, 2 Light Modes, Spooky Design, Automatic Color Change to your Shopping Cart. 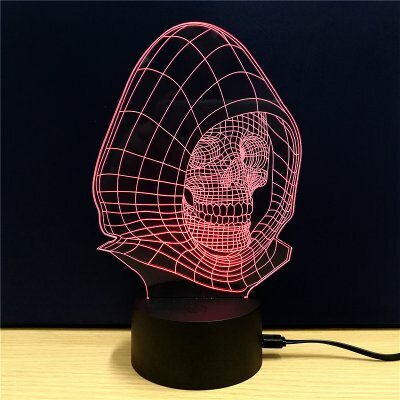 This cool 3D LED color light comes in the shape of the Angel of Death, making it a great gizmo for a teenage boy’s bedroom or to be used as Halloween decoration. Crafted out of high quality acrylic material, this LED color light is extremely tough. It is safe to use and furthermore environmentally friendly. With its compact and lightweight design, you can easily movie it around and place it anywhere in your home. If you’re still looking for a great and spooky gift for your son or for a friend, this 3D color light is exactly what you are looking for. With its 7 different color modes, this 3D LED light can be used to create the perfect spooky environment. Your gizmo features two different lighting modes. It allows you to either switch in between the different colors manually, or it you can choose to select the automatic color changing mode. This cool 3D light lets you choose from blue, red, green, cyan, purple, yellow and white light. It is powered through its micro USB port and offers an unlimited amount of fun for any young horror fan. With its unique design and color changing effect, this 3D Angel of Death LED light is the perfect add-on to your son’s bedroom. With its mind-blowing optical illusion, it sure is a fitting addition to your desk, or bed table. With its 7 different colors, this horror themed LED light is sure to impress and add style and character anywhere you place it. This color light comes with a 12 months warranty, brought to you by the leader in electronic devices as well as wholesale LED lights..